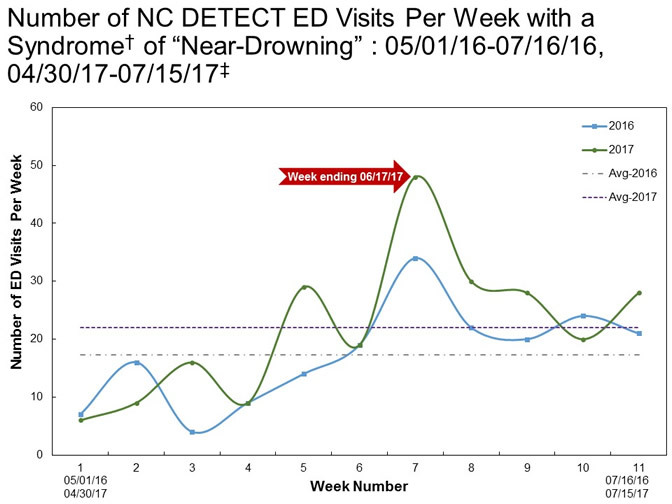 The graph below developed by KJ Harmon displays ED visits from 2016 and 2017 that were captured by the NC DETECT “syndrome” for drowning / near drowning. †Syndrome is based on a combination of keywords and ICD-10-CM codes. ‡Weekly count range starts on a Sunday and ends on a Saturday. Drownings rarely look like drownings! Often there is very little splashing, yelling, waving, or alerting someone for help. Learn more about what drowning looks like. For additional information about drowning prevention and statistics, please visit the NC DPH Injury Prevention Branch and CDC websites on drowning. Before you head to the beach this summer, make sure to check out the surf/rip tide forecast.